On the road to the White House, both presidential nominees recently stopped at Carnegie Mellon University to explore challenges and solutions around economic policy. While policy solutions differed, both candidates agreed on the hardships being faced today. "Millions of working men and women in Pennsylvania, Ohio, Michigan and beyond can tell you how urgent is the work before us," said McCain. "Far too many Americans are working hard and doing their part but still can't keep pace," said Obama. In his speech, McCain outlined a plan to review federal program budgets and institute a one-year pause in discretionary spending increases, with the exception of military spending and veterans' benefits. He also proposed a gas-tax holiday and an alternative tax system. Both candidates lauded Carnegie Mellon for its role as a part of the solution. "We need the success stories of tomorrow to be made in our labs and universities — at Pitt and Carnegie Mellon," said Obama. "This university has a fine reputation for its programs in business, finance, and other disciplines in the field of economics," explained McCain. In addition to these appearances, during the spring Chelsea Clinton and Michelle Obama also spoke at Carnegie Mellon. 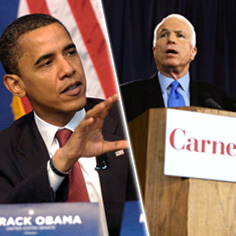 In anticipation of the presidential election this fall, Carnegie Mellon extended invitations to speak on campus to both Senator John McCain and Senator Barack Obama. The university does not support or oppose any particular candidate and maintains an open door policy to all presidential candidates.